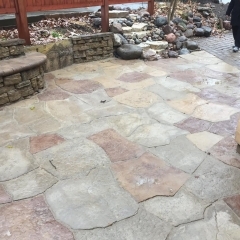 Stamped concrete and brick pavers do an excellent job of replicating the look of other materials, but sometimes nothing but natural stone will do. 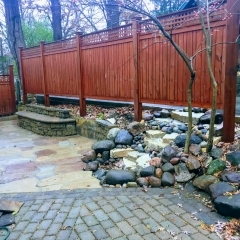 Natural stone gives a distinctive look to any hardscape, and uncut or unformed stones make wonderful, organic borders for flower beds and other landscape features. There can be as much variation in the color and texture of stone as there is in concrete, so there’s no limit to what you can design using this versatile material. Stone varieties like granite and fieldstone have many unique features that concrete doesn’t have. However, the level of variation between stone blocks makes their surfaces more uneven than manufactured concrete pavers or blocks. Keep this in mind when considering natural stone as a material for patios and driveways. If you want to create a hardscape that complements the natural Rockford, IL landscape as well as your home, contact us and ask about our options for natural stone projects. We’ll work with your budget and ideas to construct your ideal retaining wall, seat wall, or border. Interested in hearing from other customers of ours and perhaps receiving some coupons from time to time? Feel free to post feedback on our services on our Facebook page or keep up with our news on our Google+ page and we might give out some discounts for future work! Copyright © 2013-2014. Creative Concrete and Landscaping.